We will show you in this tutorial how to set the white balance so as to compensate for the dominants that certain types of artificial light (such as tungsten or neon) can produce, thus giving your images a more natural look. DxO OpticsPro 10, Essential or Elite edition. An image in RAW or JPEG format. We will use a RAW image file in this tutorial because this format has the advantage of following a non-destructive and reversible workflow, in addition to offering a wide latitude of corrections. We will also see how to apply these settings to a JPEG file, even though by definition a JPEG image has already been processed by your digital camera, so it cannot benefit from the same level of correction as a RAW file. 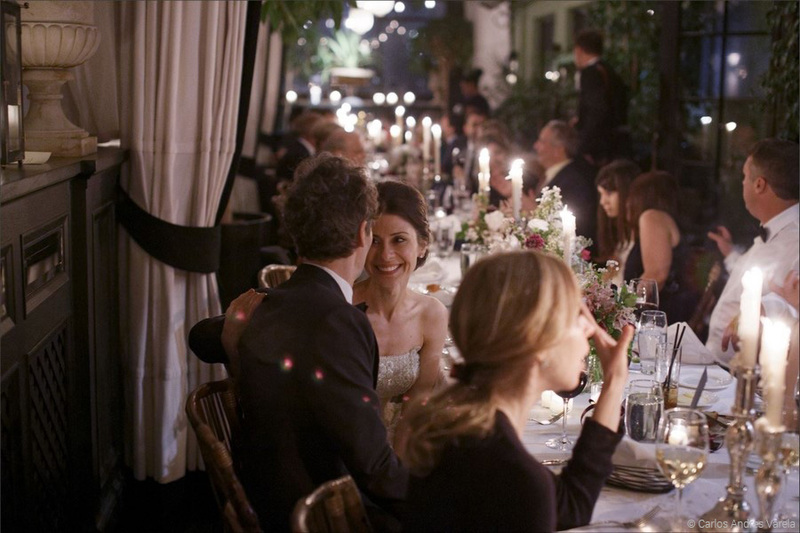 White balance consists of correcting the color dominants in an image that are produced by certain kinds lighting. It can be done right when you shoot if you set up a reference tool in front of the camera, such as a gray chart. But you as a photographer have every interest in setting the white balance in DxO OpticsPro because of the precision and flexibility of the tools DxO OpticsPro provides. Color temperature lets you determine the temperature (expressed in kelvins, K) of a light source from its color. The temperature depends on the source: we can talk about warm lighting with a yellow dominant, as with a halogen lamp light source (values inferior to 5800 K), and cold lighting with a blue dominant, for example, an electronic flash (values superior to 5800 K). The temperature of 5800 K corresponds to daylight when the sun is at its zenith (i.e., with no color dominant). We will now open in DxO OpticsPro our image that contains a neutral gray reference area. to apply corrections to your image. , which you generally use to sample a neutral gray element in your image. The Setting menu, which handles certain kinds of lighting situations. The Temperature and Tint sliders, for finely adjusting the setting. The first slider lets you control the color temperature in kelvins (K), and the second lets you refine the setting by correcting residual dominants along a green-magenta axis. The values in the histogram will let you know if you have located a good reference area. If the RGB values are similar, it means that there is no color dominant and that the white balance is satisfactory. Note that this is a case in which it is important to verify that the screen you work on is well-calibrated. 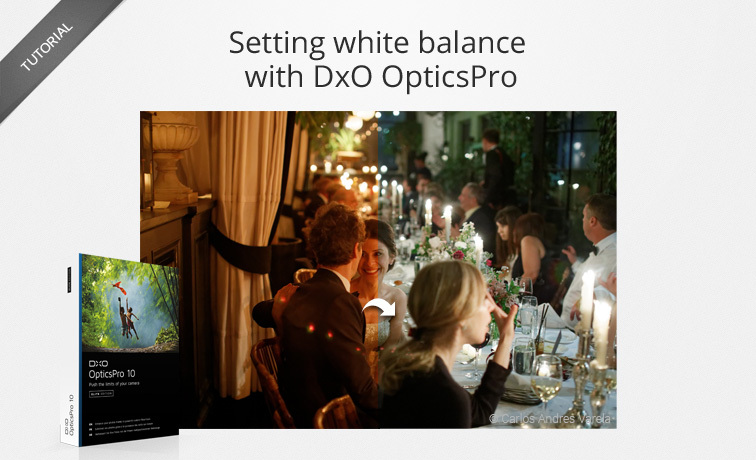 In this step, we automatically adjust the white balance in our image by using the many predefined settings available in DxO OpticsPro. The Setting menu offers predefined white balance settings based on your digital camera (which means that they will differ depending on the camera you use). You can use it to handle common situations — i.e., photos taken under tungsten lighting, under a fluorescent light, or even for images shot in the shade or under a cloudy sky. The following illustration shows, from left to right, the original image and then (successively) two predefined settings that we applied to our image: Flash and Tungsten. The Original setting is the one defined by the camera when the photo was shot. In this step, we will manually adjust the white balance using the white balance eyedropper that we use to sample a gray reference area. icon. Use the eyedropper to click within a gray reference area in the image. Here we are going to click on the shirt of the guest on the right side of the image. Your white balance is now correctly set, and you can click on the Close button located under the image. If you are not satisfied with the result, you can click on the Reset button to return to the original white balance settings. 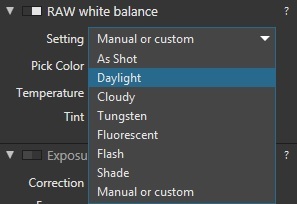 After correcting the white balance, you may also need to adjust the exposure, because the white balance correction can change certain color channels and thus end up affecting the overall light balance. The eyedropper correction is a good starting point for setting the white balance. However, it depends on how close you want the rendering to be to the original light present when you shot the photo. If you want to maintain that same atmosphere, you can use the Temperature and Tint sliders to refine your results. Here we are going to use the third setting possibility in DxO OpticsPro: the Temperature and Tint sliders. You should use these sliders if the image does not contain a sufficiently neutral element. So start with either the original image, or you can first try to get as close to the result you want by using the eyedropper tool, and then use these sliders to achieve the desired result. The Temperature slider adjusts the value in Kelvins (K): colder toward the left, and warmer toward the right, as indicated by the slider axis. As for the Tint slider, it lets you compensate for any green or magenta dominants (the second element of white balance). Here you are free to play with the atmosphere by choosing “realistic” or “creative” settings that favor either cool or warm tones. You can apply your settings to all of the images that you took under the same shooting conditions. In the image browser, right-click on your corrected image and select Copy correction settings from the context menu. Then, still in the image browser, select the other image(s) to which you want to apply the same correction. Right-click on one of the selected images and choose Paste correction settings from the context menu. Your settings will be applied to all of the selected images. Even though a JPEG file has already been processed by the camera, it is still possible to adjust the white balance to warm up or cool down the image by using the Temperature slider, which this time is not accompanied by the Tint slider. You still use the eyedropper for this. When you open your JPEG file, DxO OpticsPro automatically adapts the Essential Tools palette.